Billed as 'the world's craziest festival' and 'the world's biggest tomato fight', visitors should be prepared to be soaked in tomato juice when this quirky festival gets going. 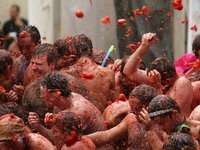 Almost 50,000 visitors descend annually on the tiny village of Bunol, just 25 miles (40km) outside of Valencia, to throw tomatoes at one another in the world's biggest food fight. Begun in 1945, allegedly as a result of a restaurant food fight, it has become a highlight on the summer festival calendar for party-animals, with thousands of people flocking to decimate the loads of tomatoes brought into town on lorries. The street party is worth enjoying even if you don't get clobbered with a ripe juicy fruit. The actual tomato fight only lasts about an hour. Since 2013 the event has been regulated with ticket sales to limit the numbers as the town can only hold so many and the event grows in popularity every year. The tomato fight takes place in the old town, centred on the Plaza del Pueblo. Safety goggles are a good idea to protect your eyes and generally participants choose to be very scantily clad due to the mess. The week-long festival also features live music, parades, fireworks, street parties and cooking contests.